I can't believe it's been almost two weeks since I last posted. I've been so busy at home and at work ... time just keeps slipping away from me. I do have a fun little art and poetry activity to share with you. Recently I've had a few questions from my followers asking me how I have the time to squeeze in art activities with my students. In Ontario, Visual Arts is part of our curriculum - and we have to assess it and report on it. We actually have 4 different Arts strands: Drama, Dance, Music, and Visual Arts. We need to report on 3 out of 4 of them twice a year. I'm so happy to have the opportunity to teach Visual Arts to my students. They LOVE the art activities (even the students who aren't "natural artists", and it brings such a needed calmness to my class. We've been working on this activity for about two weeks - in little chunks here and there. I was so inspired by Stephanie's beautiful Fall Poet-Trees over at Teaching in Room 6, I knew I had to do an activity like this with my kids. Fall is my ABSOLUTE favourite time of year, and I am often in awe of the stunningly beautiful colours in nature right now. I knew I had to bring a little of this into my classroom. Last week I took my students on a nature walk, where they needed to collect three different leaves - in different shapes and sizes. Back in the classroom, I asked them to sketch (not trace) these leaves - sketching 2 of each leaf. As part of our "Working on Writing" in my daily 4 rotations, we had minilessons on and wrote about rhyming couplets, triplets, and quatrains. Over the week, my students wrote 2 of each of these types of poems, all with a fall theme. Today we put it all together. 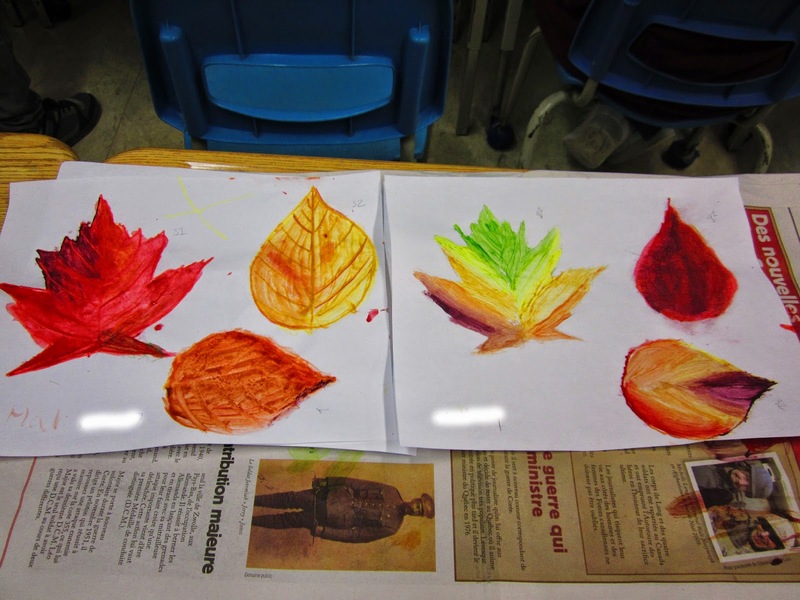 The students used acrylic paint (in warm colours) to paint their leaves. We did three different paint techniques on the leaves - for two of them we used wax crayons to outline the veins before we painted, on another two we sprinkled salt over the wet paint (didn't quite get the effect I was looking for, though), and we "smooshed" the wet paint on the last two using a plastic bag. The students were also to mix their paint colours when painting the leaves to make them look more realistic. When the paint had dried, the students used an extra-fine tip sharpie marker to write their Fall poems on the leaves. They then cut their leaves out. The students gave me three of their six leaves and I created a beautiful "Falling into Poetry" bulletin board just outside of our door. I used 1" straight pins to attach the leaves to the board, so they stick out of the board a bit to really give it that feel of "falling" leaves. The students then used their last three leaves to create a beautiful art piece to add to their end of the year art/poetry books. I had them use oil pastels (in cool colours) to colour an 8 1/2 x 11 piece of plain white paper. Because we've just started our patterning unit in math, I asked them to make a pattern with their background. They then glued their leaves onto the background. We shaded one side slightly to give the appearance of some dimension on the leaves. LOVE how they turned out!!! Okay - lastly ... this weekend is Thanksgiving weekend in Canada (YAY for long weekends). My littlest little turkey would like to show off her new shirt (made by one of my fabulous co-workers) and wish you all a happy Canadian Thanksgiving! So pretty Jen! I love how you do so much art with your students. Fabulous! And thank you for the shout out :) Glad I could inspire! I LOVE your fall leaf pictures and your little girls is just a DOLL! You really have that passion in Art. I am so amazed with what you shared here. I am an art lover and an art believer, but unfortunately I was not given the talent to put into art my expression of it. Thank you for sharing this post and good luck to you and may you continue to share your talents to others. Love the art work your student have done! It was a perfect match...the poetry, art, and fall!! Thank you .. thank you! I love this idea. In my class, they were working on word choice last week. This was a great opportunity to work on word choice through poetry... I would love to send you a picture.